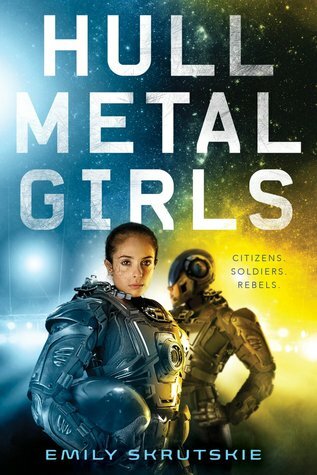 Hullmetal Girls is a YA science fiction story set in the future. Earth is no longer habitable and humans have taken to the stars, flying in a fleet of ships through space looking for another planet to call home. But it’s been 300 years and still they’ve found nothing. The governing body uses Scela, mechanically enhanced humans as their super soldiers, keeping the people of the fleet in line. The story is told from the perspective of two newly modified Scela, Key Tanaka & Aisha Un-Haad. The two girls couldn’t be more different, but in order for each of them to succeed, both as new Scela and in their own personal agendas, they must learn to work together in their new bodies. I really, really enjoyed this book. The more sci-fi I read, the more I realize it is one of my favorite genres. I love the spaceships and action and the complicated underlying themes. Not to mention the fantastic characters and the relationships that play out between them. I included a trigger warning above for body horror. The scenes did not bother me, but I could see where it may be a bit disturbing to others. That said though, I think this allows the author to explore some important issues. What does it mean to be human? Does body modification make someone less human? And how far are you willing to go to help your family? There are lots of family themes in this book as well. Both the traditional type and found family, which is my favorite. I thoroughly enjoyed this read and am definitely looking forward to reading more of the author’s work. Thank you so much to Delacorte Press, Random House Children’s and NetGalley for sending me a copy of this book in exchange for an honest review.